My Bus might just be the best book that “teaches” Math for the youngest child. Joe drives his bus to town. At his first stop, he picks up one dog. At his second, two cats get on the bus. Each stop adds more cats or dogs, in sequential order. When Joe finally fills his bus he has five cats and five dogs. He then delivers them to their destination, but not by ones: “I drive one dog and two cats to the boat. They sail away.” Next, he delivers two dogs and one cat to the train. He continues on his route until, at last, he arrives home with one dog—his dog. In this way, the child may have his or her first exposure to subtraction. Barton has created a clever and subtle way to incorporate addition and subtraction into the story without using the typical counting book format. On the last page, night has fallen and Joe’s bus is parked. But two cats are heading toward the bus, perhaps anxious for the next day and the opportunity to ride off on a new adventure. One word ends the story: Meow. 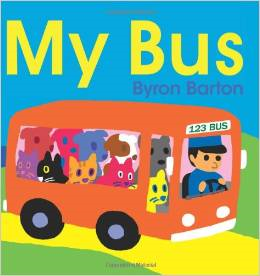 According to the jacket copy, “Byron Barton is the creator of many picture books for young children, including My Car, Building a House, Machines at Work, and Little Red Hen.” After reading My Bus, I can’t wait to read the rest of them. I know there are more delightful stories waiting for me—and my two-year-old granddaughter—to discover. Thanks, Stephanie. I’ll look for his books..